I could have used that last week. Took 2 hours to get a set of lug nuts loose on an NPR. Even managed to crack a socket in the process. Blizzaks are definitely one of the better studless snow tires. I would also take anything from Nokian. My Rigid impact is supposed to rated higher than the Makita (or it was at the time of purchase), but I think the battery holds it back, it cant loosen over torqued car lug nuts to save its life. 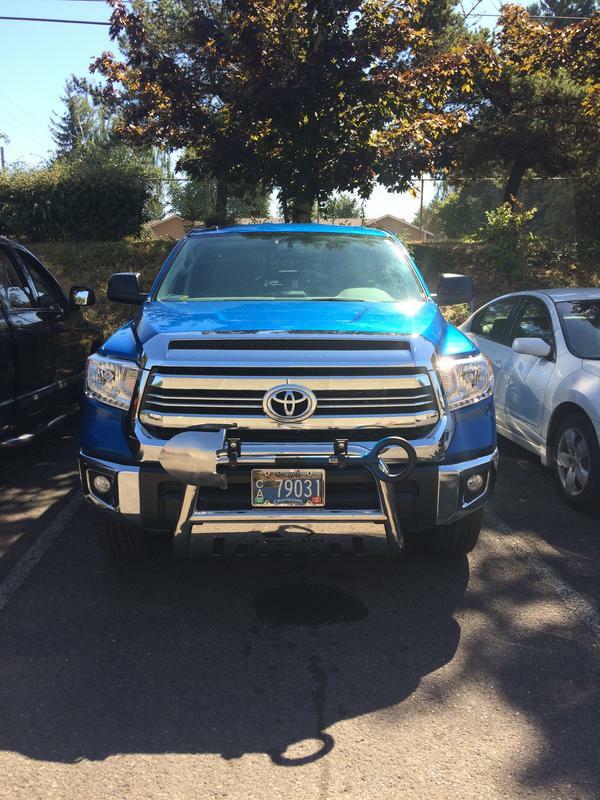 Blue...I has a set of Toyota steel wheel sensors if you decide to get those. All that would be needed every change over is a quick reprogram. The aluminum wheel sensors won't fit the steel wheels or vice versa. DRIVEN wrote: I could have used that last week. Took 2 hours to get a set of lug nuts loose on an NPR. Even managed to crack a socket in the process. Laecaon wrote: Blizzaks are definitely one of the better studless snow tires. I would also take anything from Nokian. Hmm mm I didn't even look at the rigid or know what the spec was. I just glanced at my makita specs and it's at 740ft tightening and 1180ft break away. All I remember (vaguely) is that milwaukee and dewalt were at same or similar figures. They all do the job though. flatcat19 wrote: Blue...I has a set of Toyota steel wheel sensors if you decide to get those. Thanks flat ! I wish there was one sensor for both wheels lol. I bought this shovel off Amazon. I use them for camping , and winter on my rigs is all. Bolted it up with ss allen head bolts right then , and had locks/quicker disconnects on the way. It has had a generous amount of approval interestingly enough. Not sure I'll leave it there for the long term. If you use it, it's awesome. If it's just for looks, any ribbing is probably well deserved. At least it could be practical. I had to carry a shovel and fire extinguisher up Chelan Butte when I flew hang gliders there, it was one of the rules otherwise you didn't fly there, never seen anyone ever use either but I suppose better safe than sorry. I expect if you do any real 4 wheeling it might come in handy, I was just at the British Field Meet at PIR and there were a bunch of Land Rovers there with shovels and picks mounted on the hoods and front fenders along with the spare tire in the center of the hood along with a rack the entire length of the cab top, them guys used to use them trucks back in them days, now days they are just poor copies of real work horses of the past. DRIVEN wrote: If you use it, it's awesome. If it's just for looks, any ribbing is probably well deserved. Agreed. I already got ribbed before getting to use it. Had a few good laughs. Laecaon wrote: At least it could be practical. Even if I have to get my co-workers stuck Ram15000 out of the fire stations lawn during the winter storm...yet again. wayno wrote: I was just at the British Field Meet at PIR and there were a bunch of Land Rovers there with shovels and picks mounted on the hoods and front fenders along with the spare tire in the center of the hood along with a rack the entire length of the cab top, them guys used to use them trucks back in them days, now days they are just poor copies of real work horses of the past. Care to clarify on the poor copies part ? as I've only had direct experience with a few 1995/1996 Land Rovers. As I mentioned I was at the PIR British Field Meet which has older British vehicles. The crap they have made for the last 35 years is what I am talking about, they are copies of real work horses, I don't hear about anyone exporting newer used all terain vehicles to Africa, but they love them old Toyota Land Cruisers and the like. Gotcha Wayno. I've never been around anything older than a 1995 Land Rover. My buddy and I welded up , and slapped on a roof rack with the usual goodies to accompany them years ago. Both were gas 5spds 4wds and were quite fun to drive , camp , or just run around in. Of course he took some of his rigs farther off road and went too deep in water one time. Both of them were plagued with PROBLEMS. The techs that specialized in them said if you're willing to upgrade a lot they're pretty neat. I think I saw 8 of the same-ish model/year on the side of the road going to the coast from Portland (not that many miles at the time). Love the old land cruisers. Some old tech is hard to beat. Even though I wasn't really planning on it.....Who could REFUSE !? Which is why I didn't. I saw the truck these came off of (was new). They had just had discount tire hook them up with new shoes..
Would have been irresponsible not to. Don't expect lots of miles out of those. They're super soft. But way worth the $300. 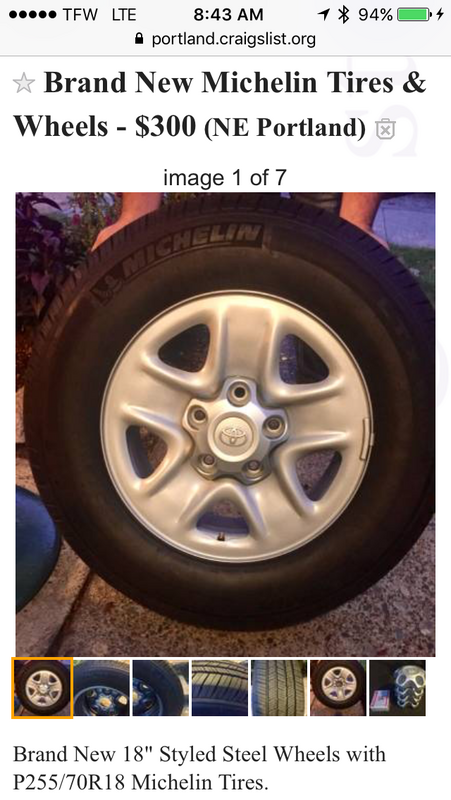 I almost scored some Blizzaks on my same OEM wheels for $250. They were 70% tread life. DRIVEN wrote: Would have been irresponsible not to. flatcat19 wrote: Don't expect lots of miles out of those. They're super soft. But way worth the $300. Laecaon wrote: I almost scored some Blizzaks on my same OEM wheels for $250. They were 70% tread life. Thanks. $250 is a good deal for those !